The scholar-poet-playwright George Chapman (c. 1559-1634), translator of Homer, was well acquainted with Edward de Vere the seventeenth Earl of Oxford, who was about a decade his senior. Aware that Oxford’s creation of the character Hamlet was essentially a self-portrait, the younger man knew very well the correct answer to the Shakespeare authorship question; and after the earl’s recorded death in 1604, when the full Hamlet was printed in quarto, Chapman made every attempt to tell the rest of the world. The written testimony of George Chapman is No. 77 of 100 reasons to conclude that Edward de Vere was the author “William Shakespeare” – and this evidence comes so close to the proverbial “smoking gun” that I might wonder why I waited till now to include it. It appears that Chapman was obsessed with Edward de Vere. GUISE: Why stand’st thou still thus, and appliest thine ears and eyes to nothing? CLERMONT: Saw you nothing here? GUISE: Thou dream’st awake now; what was here to see? CLERMONT: My brother’s spirit, urging his revenge. GUISE: Thy brother’s spirit! Pray thee mock me not! CLERMONT: No, by my love and service. But Chapman was conflicted about Oxford. On the one hand he had a “negative and grudging” attitude toward the noble poet, Burris notes, and on the other hand he admired him. Chapman himself was apparently quite different from the earl in his personality, viewed by some as “of most reverend aspect, religious and temperate, qualities rarely meeting in a poet.” And while Clermont’s story is based on that of Hamlet, he is nonetheless the opposite in manner: calm, austere, stoical – Chapman’s preference. So when Clermont continues his speech about Edward de Vere, he begins to switch gears by describing Oxford’s refusal to review the army of Duke Casimir, a German Calvinist prince and leader of Huguenot [French Protestant] forces against the Catholic troops of Henri III. Oxford had left Venice in March 1576, traveling via Milan and Lyons to Paris on his way to the English Channel and home. For the entire month the two opposing armies in France’s current religious war were camped at Moulin in central France, according to researcher Nina Green, who adds that very likely Oxford passed very near Casimir’s six thousand troops on the way. Out of his own free fore-determined course. It being an offer so much for his honour. To take those honors that one cannot quit. 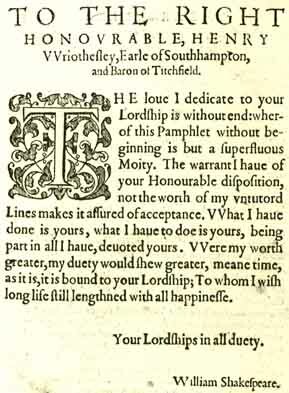 George Chapman’s first published poem, The Shadow of Night (1594), reflects his membership in the contemporary group that became known as the School of Night — learned men such as playwright Christopher Marlowe, astronomer-mathematician Thomas Harriott, writer Thomas Nashe, Sir Walter Raleigh and, yes, the poet-playwright Edward de Vere. 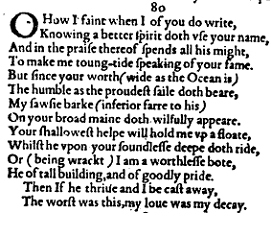 In 1605, when Chapman collaborated with Ben Jonson and John Marston on the comic drama Eastward Ho!, that play contained no less than five allusions to Hamlet. [The three authors were briefly imprisoned, because of perceived slurs against the Scots who had come to court with King James.] One of the characters is “Hamlet, a footman” and another is “William Touchstone,” who has a daughter named “Gertrude” – the name of Hamlet’s mother. Other characters are related to Oxford himself, such as “Golding,” the name of Edward de Vere’s uncle, Arthur Golding, who is credited with translating Ovid’s Metamorphoses. Monsieur d’Olive, representing Oxford, slips right into Shakespeare references, such as his statement: “The weaver, sir, much like the virginal Jack, start nimbly up” – echoing Shakespeare’s Sonnet 128: “Do I envy those Jacks that nimble leap.” Such deliberate attempts to link Oxford with Shakespeare bring us “almost into smoking-gun territory,” wrote Robert Brazil. * Chapman in the early 1580s was in the household of Sir Ralph Sadler, who was employed by both Queen Elizabeth and William Cecil Lord Burghley, who was Oxford’s father-in-law. * Chapman was friends with Oxford’s daughter Susan de Vere, Countess of Montgomery, wife of one of the “incomparable pair of brethren” to whom the First Folio of Shakespeare plays was dedicated. For his translation of the Illiad, published in 1609, Chapman wrote a dedication poem to Susan de Vere – in the Shakespearean sonnet form. 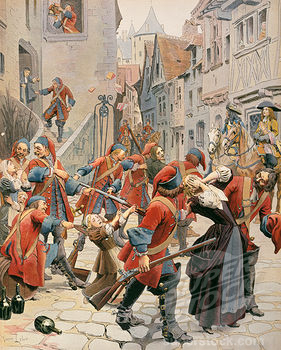 * Chapman is linked to Oxford’s military cousins Francis and Horace (Horatio) Vere, known as the Fighting Veres. “Early in his career,” Whalen writes, he “described in minute detail an incident in Sir Francis Vere’s campaign in the Netherlands, while late in his career he urged the rescue of Sir Horace Vere and his troops who were besieged in Germany.” And, of course, the play Hamlet includes a soldier named Francis and another soldier, the Prince’s trusted friend, named Horatio. The So-Called “Rival Poet” of the Sonnets is NOT A REAL PERSON…. A section of the Shakespeare sonnets (78 to 86) has been known traditionally as the Rival Poet Series. Stratfordians and anti-Stratfordians alike, including most Oxfordians, still assume that this figure must be a real individual such as George Chapman or Walter Raleigh or Robert Devereux, Earl of Essex. Well, I suggest this demonstrates yet again the power of a prior assumption or a long-held belief that is taken for granted and never questioned. Under the belief that William Shakspere of Stratford was the author, it’s a given that the Rival Poet must be a real human being. But once Edward de Vere, Earl of Oxford is postulated as the author known as “Shakespeare,” it’s not only possible but inevitable that the Rival Poet is none other than his pen name or public persona, which is getting all the attention as the writer linked to Southampton. As mentioned above, most of my own colleagues, while convinced that Edward de Vere was the great author, still assume that the Rival Poet is a real person. [The latest candidate of choice is the Earl of Essex.] Yet the case for Oxford is based on the premise that in fact he’s living with a split personality! 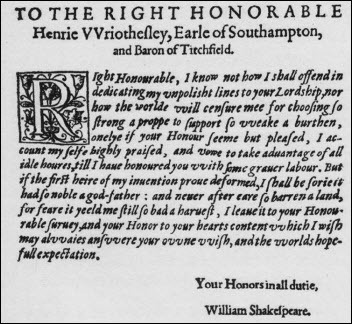 This is seen clearly in the personal sonnets, where he himself is PRIVATELY writing to Southampton while his alter ego “Shakespeare” is PUBLICLY addressing him (in the dedications still being printed in new editions of the narrative poems). “My name be buried where my body is,” he writes in Sonnet 72, leading up to the “rival” series. To make me tongue-tied speaking of your name. "Knowing a better spirit doth use your name"
Would the Earl of Oxford, Lord Great Chamberlain of England and highest-ranking earl of the realm, ever, under any circumstances, call anyone else, including Chapman or Raleigh or Essex (whom he really disliked), a “better spirit”? I think not! Could that be any clearer? 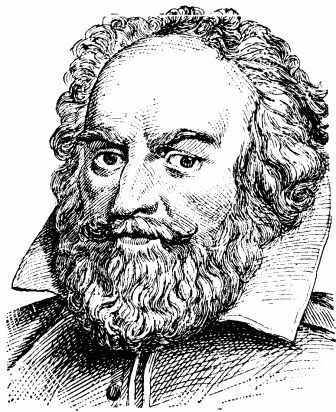 He correctly predicts that Southampton will be remembered because of the Shakespeare connection; and then he says directly that, after his death, he will have to “die” all over again “to all the world” – which can only mean that he anticipates his own obliteration as “Shakespeare,” who publicly devoted his labors to Southampton. By what logic, and for what reason, would the traditional Shakespeare write such words? This is just one piece of the puzzle among others needed to create the full picture. I’ll be back with more such pieces, as set forth in The Monument … in Shakespeare’s Son and His Sonnets … and in Twelve Years in the Life of Shakespeare.